Instant Pot Mashed Potatoes, are smooth, fluffy and creamy perfection in the pressure cooker. They are a time saver for Thanksgiving and Christmas dinner! Steaming the Potatoes in an Instant Pot, Mealthy MultiPot or Pressure Cooker, instead of boiling them in water will take your ordinary Mashed Potatoes to a new level. No more standing over a stove with a fork, waiting until your boiled Potatoes are just right. No more water logged Potatoes! The days of boiling water, adding Potatoes and then poking with a fork to check for doneness are over! 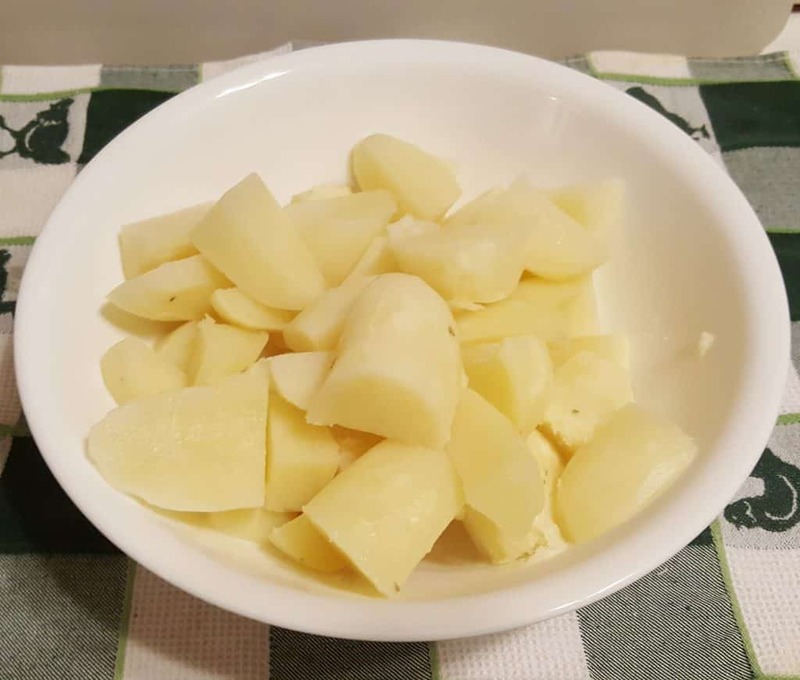 Steaming Potatoes in an Instant Pot, Mealthy MultiPot or Pressure Cooker using the pressure cook function, yields a nice and dry Potato. 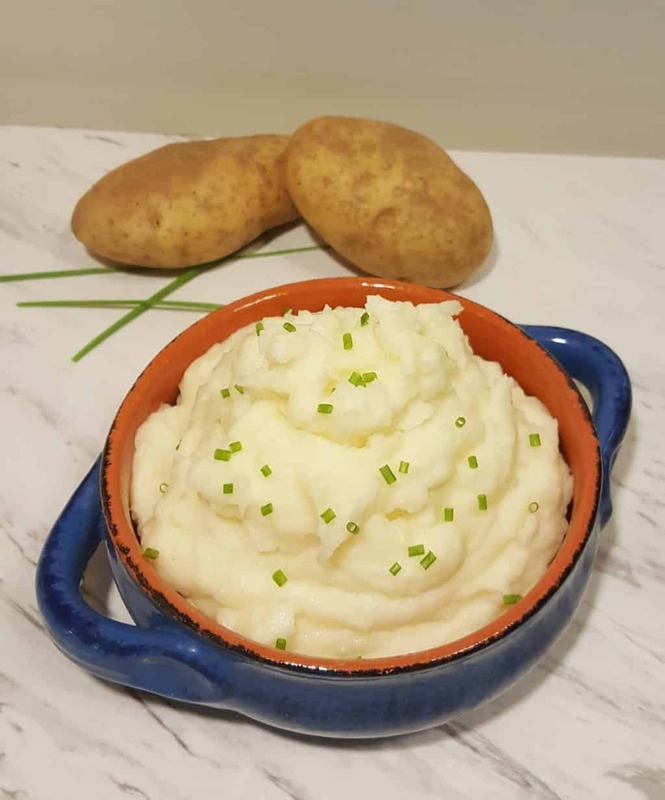 The perfect base to make fluffy and creamy Mashed Potatoes or Smashed Potatoes or Whipped Potatoes! Ingredients for Instant Pot Mashed Potatoes. 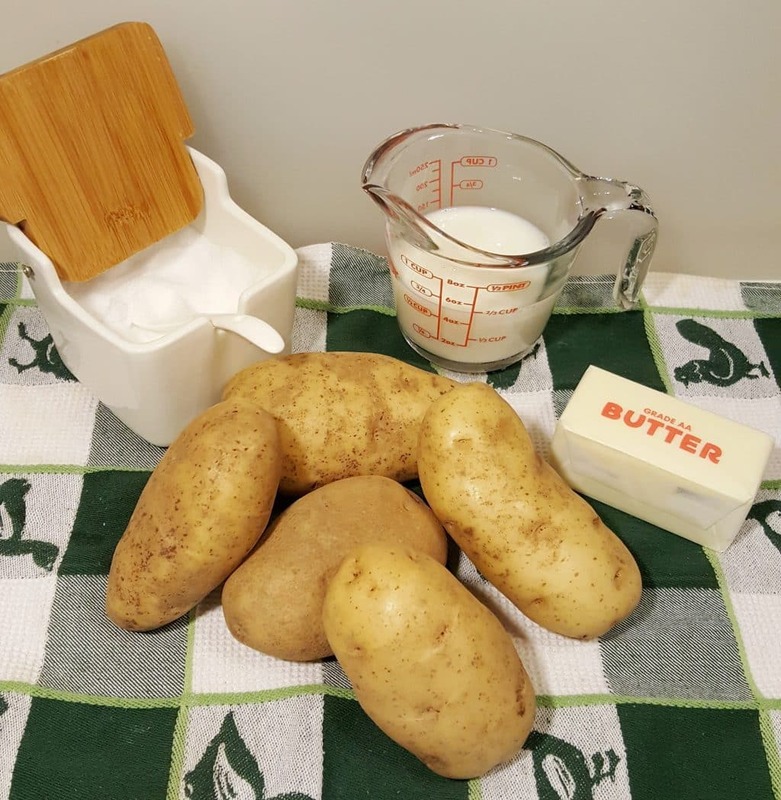 Potatoes – Idaho Russets and Yukon Gold are delicious. Does Type of Potato Matter? Russet potatoes are best cooked using the steam method. When boiled in water, they tend to fall a part and become gummy and not pleasant to mash. Yukon Gold potatoes are more versatile and can be boiled or steams. In my opinion, whatever type of potato you want to use for mashing, tastes better after being steamed. In my Pressure Cooker Syracuse Salt Potato recipe, new potatoes are used, as they work well cooking in water. Potatoes are one of my favorite foods to eat, in all forms. It is also one of the only types of food, where I add salt to taste. I use salt sparingly when I cook. Potatoes, Eggs and Rice, are the three types of food, where I do like to have a little bit of a salty taste. If you would to make Pressure Cooker Garlic Mashed Potatoes, just add a couple cloves of peeled Garlic in with the Quartered Potatoes. 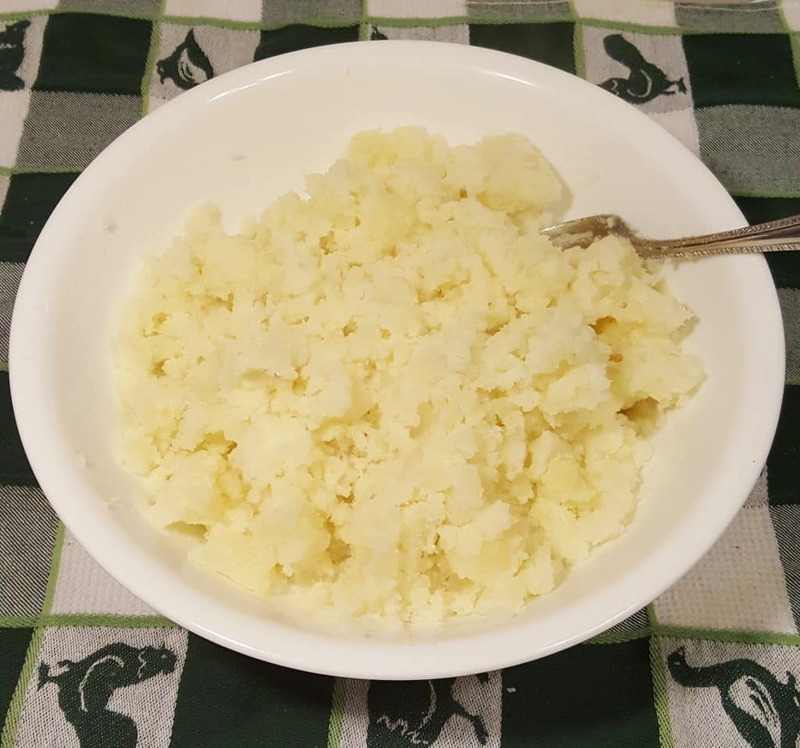 If you have a picky kid or adult (as do I) and want to hide a vegetable, add in some raw Cauliflower and then mash it with the Steamed Potatoes. 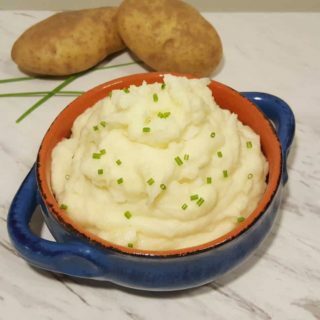 How to Make Instant Pot Mashed Potatoes. Peel or leave skins on. Cut the potatoes in chunks. Soak in a big bowl with water to remove some of the starch. Use a Strainer Basket to cook. Starting with room temperature butter and milk, make things easier. 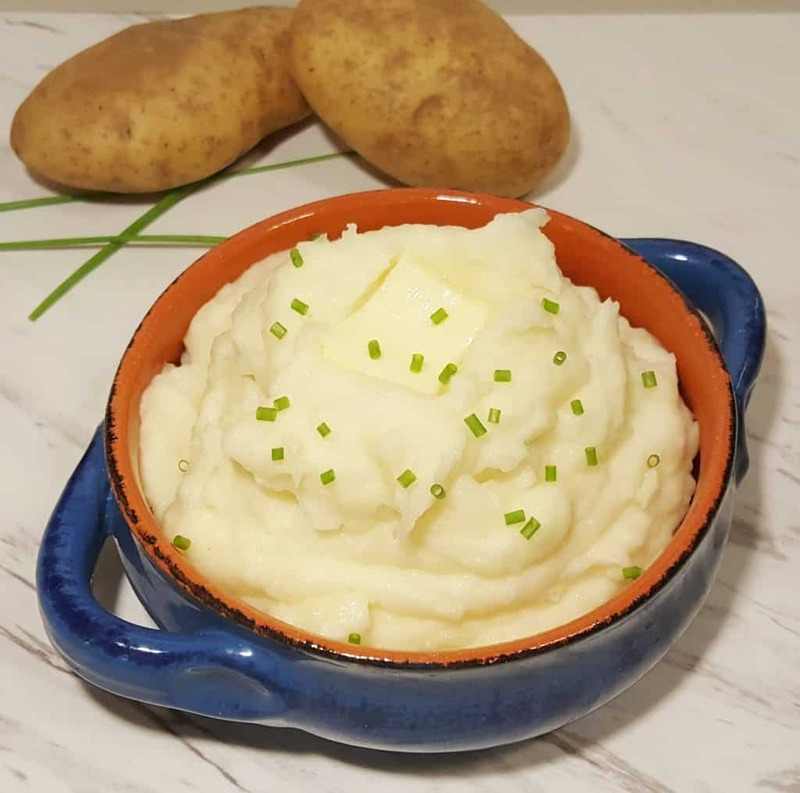 For my favorite take on Pressure Cooker Instant Pot Mashed Potatoes, try my Healthy Pressure Cooker Potato Carrot Mash. The carrots add such a nice color, but best of all, vegetables! Half the calories of regular Mashed Potatoes and just as good, if not better taste (in my opinion). Even my picky eater, loves the Potato Carrot Mash! For special occasions and company, this Pressure Cooker Creamy Mashed Potatoes is oh my gosh, so friggin’ delicious. You can also pile up the potatoes on a Trivet to steam. The Potatoes are nice and firm, yet nicely cooked. They are not falling apart or mushy. 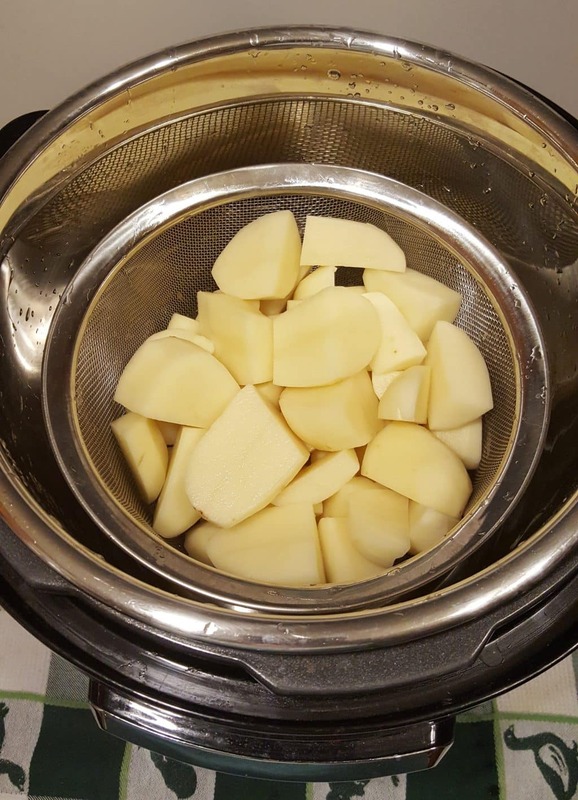 If this photo does not convince you that Steaming Potatoes in an Instant Pot, Mealthy MultiPot or Pressure Cooker is the way to go, I don’t know what will. Sure, you can steam Potatoes on the Stove, but you would have to hang out with them, until they are done. While they are steaming in the Instant Pot, Mealthy MultiPot or Pressure Cooker, you can go take a shower, wash the kid, set the dinner table, etc. The taste will be pure Potato, not watered down Potatoes! Use a Potato Masher or Fork to Mash the PLAIN Potatoes, while hot. Not everyone agrees with me, but in my opinion, order matters. The more you mix the Instant Pot Mashed Potatoes, the more smooth and Whipped they become. Turn mashed potatoes into Instant Pot Whipped Potatoes, just by hand whipping or using a hand held electric mixer. An immersion blender will work super fast too. Tips and Tricks for Instant Pot Mashed Potatoes. Store potatoes in a cool place. 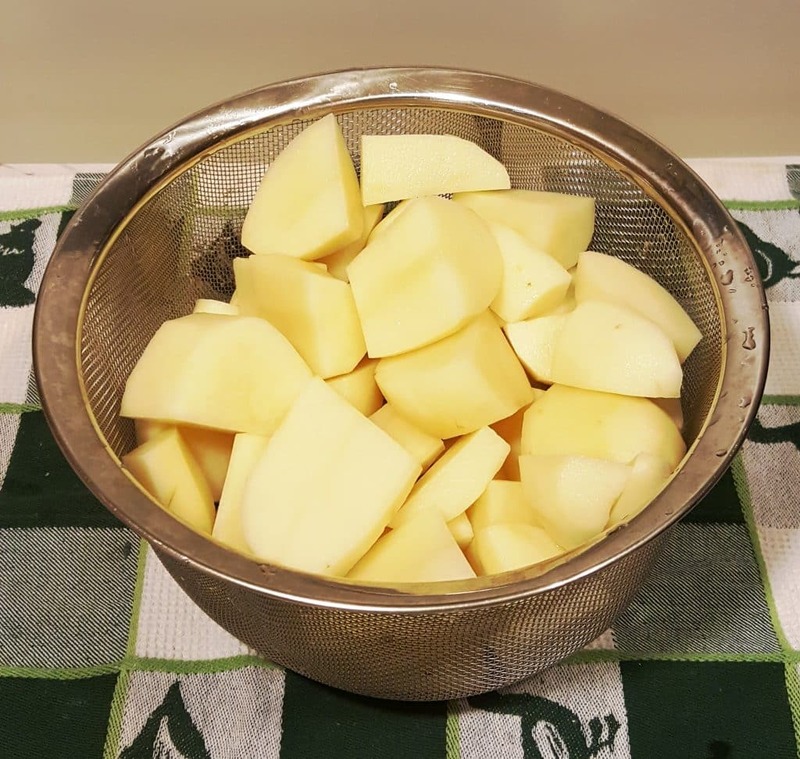 Place potatoes in a bowl of water as soon as they are cut or peeled to remove starch. This also prevents the potatoes from turning black. Otherwise, they will have an enzymatic reaction from the oxygen and turn black. 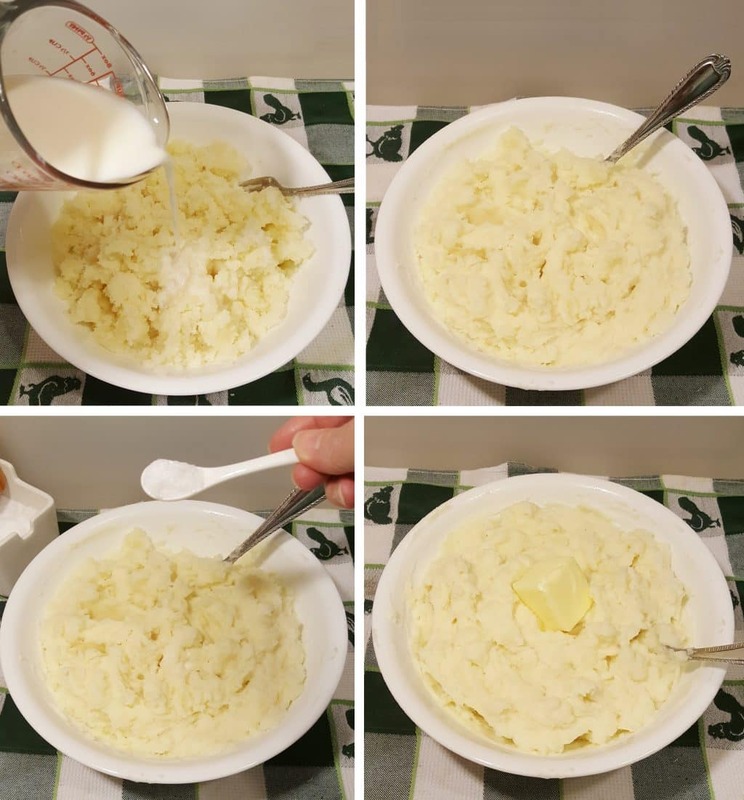 If you take out the milk and butter before cooking, it will be easier to incorporate while mashing potatoes. 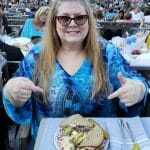 Serve along side my Pressure Cooker Classic Pot Roast Dinner, Pressure Cooker Best Ever Meatloaf or any of my other delicious main courses. Place Water and Trivet into Pressure Cooker cooking pot. Place basket of quartered potatoes on top of Trivet. Lock on Lid and close Pressure Valve. Cook on High Pressure for 7 minutes. When Beep sounds, allow a 10 minute Natural Pressure Release. Remove Potatoes from cooking pot and place into Mixing Bowl. Mash Potatoes and add milk, mashing/whipping as you go. Add Salt and mix. Add Butter and combine. Taste and adjust as needed. Top with Chives, if desired. The more you mix the Instant Pot Mashed Potatoes, the more smooth and Whipped they become. Turn Mashed Potatoes into Instant Pot Whipped Potatoes, just by hand whipping or using a Hand Held Mixer. PIN this Pressure Cooker Instant Pot Mashed Potatoes! 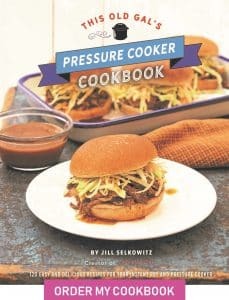 My pressure cooker takes a long time to pressurize (20+ minutes). Is that normal? I thought pressure cooking was supposed to be fast results. Depends on a few factors: how much food do you have in the pot? did you put in the minimum amount of water (1 cup), is the food frozen?, did you use hot or cold water? is the pressure knob all the way in the cooking position? Remember, that it’s not a microwave, you aren’t going to get instantaneous results, it’s going to cut your cooking time in half. For instance, I made 2 lbs of short ribs in less than 40 mins from start to end (saute, cook, release) if I were to make them in my slow cooker it would be at the very least 4 hours of cooking. (also, slow cooker recipes can be converted to the IP by cutting the water down to half, and the cooking time in half as well. BTW, it took about 10 mins for the ribs to come to pressure but it was also because I had sauted them first which made the pot preheated, you can preheat your pot on saute on low or medium if you want to help reduce the pressure time. Hope this helps. I am new to this as well but have spent a few hours watching youtube videos, reading blogs and joined a couple of groups on Facebook. Love my pot. I made steel oats this morning and it was wonderful and easy. Good luck. If you will put it on “sauté” while you are adding in your ingredients, it will come to pressure MUCH faster after you put your lid on and lock into place. Made these mashed potatoes last night and my husband loved them. Thought they had so much more flavor. I did take the time to soak the potatoes but without that step it really doesn’t take any longer than cooking on the stop and you don’t have to worry about them boiling over! I’m thinking about making these for Thanksgiving. I have 28 people coming (4 are kids, 2 are babies). 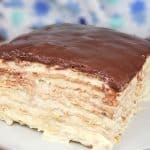 How many multiples of this recipe would you recommend? How many would fit in the IP 6 quart? Can they be kept warm, and for how long? (thinking my Wonderbag ‘crock pot’). Thanks! I want to make this for thanksgiving but need to cook at least 5 pounds potato. 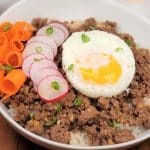 What changes do I need to make for my Instant pot? 6 qt. I know this is an old post, but did you put the 5lbs all at once? Did you use a mesh pot? Thank you! I’m not the best cook in the world… LOL Any tips on how long it would make to reheat them up tomorrow if I made them today? If I want to try this recipe with 6 lbs of potatoes, would you recommend putting the cut up potatoes directly on the trivet? Would you change the cooking time? Is the cooking time the same for red potatoes? I clicked link to strainer basket to purchase one. The stainer basket in pictures does not show handles but the strainer basket in the link has handles. Doesn’t look like it will fit into the IP? Can I use red potatoes with good results? These turned out really good, I am a newbie Instant Pot user and was curious about making mashed potatoes. 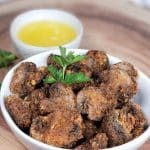 I made them for Christmas and let them stay warm in the instant pot for about an hour. 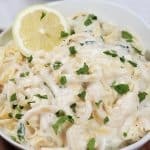 I belong to a facebook beginners group and this recipe was posted, that is how I found your site. I reduced the amount of butter for a special diet and they were still delicious. We have made these three times now. The first two times they turned out wonderful, but tonight the potatoes came out severely undercooked and the batch was ruined. We did everything the same as usual and exactly how the recipe states….Any ideas? They were no where near cooked and we didn’t think that we could go back in and cook them longer in the IP once it’s been opened….wouldn’t know how much longer to cook them for. What we ended up doing was mashing them up the best we could and then finished them in the microwave, and did even more mashing. Hoping they turn out better next time. Do you qr the rest of the pressure after the NPR for 10min? do you QR after the 10min NPR? 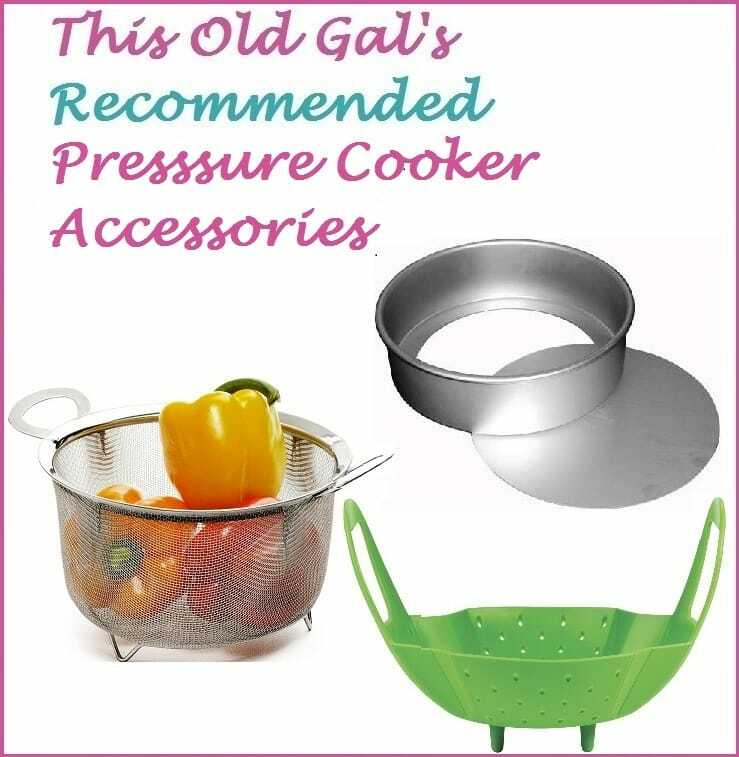 Please be aware that the link to the steamer basket in this post goes to one that does NOT fit in the Instant Pot. It has handles that stick out and do not fold. I didn’t realize the mistake until I received it. Ufortunately, it was an add-on item, so not worth it to return and pay return shipping. I did 10 lbs of mashed potatoes today for Easter dinner. Five pounds done following this recipe and five pounds boiled on cook top. All ten pounds came from the same bag, same amount of butter & cream in each batch. Everyone loved the instapot potatoes. They were gone with a quickness. Best. Potatoes. Ever!! No more boiled potatoes for this family!! Oh, and even with waiting for pressure to build & NR the insta pot potatoes were done 10 min before the boiled ones. Thanks so much for the recipe!! LOVED this recipe as well. I tripled the recipe and all ingredients. Was it necessary to triple the “boiling water” at the bottom of the pan or would 1.5 cups of water be enough to steam 6 pounds of potatoes? I cooked for the same 7 minutes as well. Thanks so much for all your great recipes. How did it turn out when you tripled the recipe? I would like to make 10 lbs in my 8qt IP. Fantastic! I used whole milk and unsalted butter, sparing no calories. Served with your Pressure Cooker Salisbury Steak with Onion-Mushroom Gravy. Ultimate comfort food! I don’t have a steamer basket yet. Can I cook these right on the trivet in my 8qt pot? Hey Jill! Made this and it was devoured by myself and my family. I ordered your cookbook months ago, any idea when it will be here? 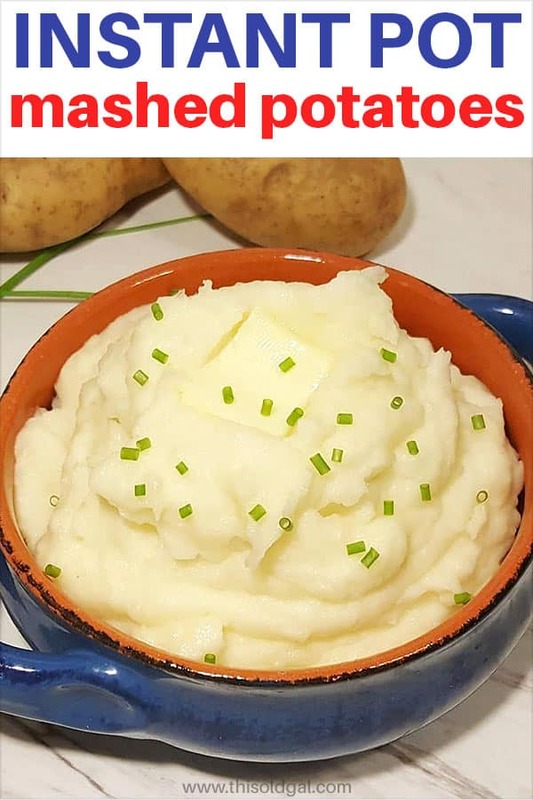 I really want to try these mashed potatoes but I was wondering, how long do the cut up potatoes need to soak in the bowl of water before cooking? Is the time the same for cooking 5 pounds in the 8 quart? Hi Jill! I am planning on peeling and cutting my potatoes up the night before cooking them. Would it hurt if they soaked in water overnight? I know it will keep them from turning black,but will it ruin the taste and/or consistency? Thanks Jill! I made your mashed potatoes today for the 1st time in my IP Mini. I used yukon gold and they were great. Will try these today on my family for Christmas dinner. You’ve not failed me yet! Your yogurt, boil method, is something I make each week. I made your mashed potatoes on New Year’s Eve to have with a prime rib and they were great! But it occurred to me that maybe it would be even better to cook them on the Steam setting instead of Pressure since you mentioned in the dialogue that steamed potatoes are the best. But I’m not sure what the difference is between the regular Pressure setting and the Steam setting. I wonder what you think. Thanks for your great recipes, especially your book!